On January 12th, 2010, a magnitude 7.0 earthquake struck Haiti, bringing devastation to an already impoverished nation. Hundreds of thousands lost their lives; more than 1 million were displaced, and tens of thousands were injured—including countless children and young people who suffered the loss of limbs. Against this backdrop, two American organizations stepped in to provide aid. Facing political corruption and the threat of failure, Project Medishare successfully set up clinics for the victims, and the Knights of Columbus ensured that prosthetics limbs would be made available for every young amputee. But this was only the beginning of the story. 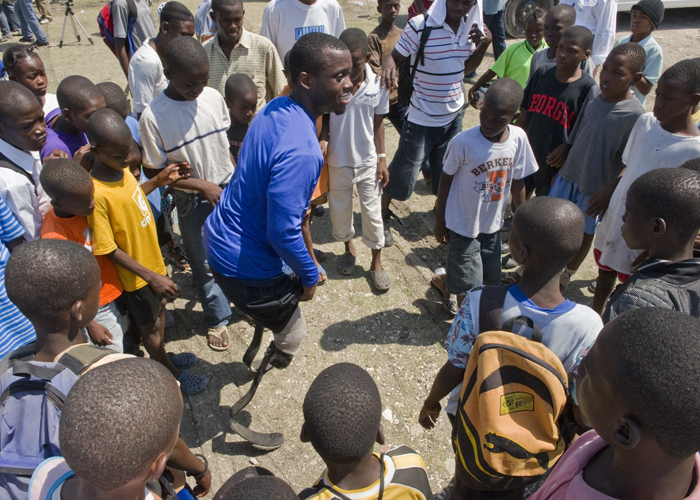 Amidst incredible odds, a small group of earthquake victims became emboldened to defy deeply entrenched Haitian stereotypes against people with disabilities. Team Zaryen was formed, an amputee soccer team that transformed victims into beacons of hope, creating real possibilities for those attempting to rebuild their lives – including U.S. soldiers returning from wars overseas. At times a searing analysis of the post-earthquake horrors and Haiti’s turbulent history, and at times a poignant sports story about overcoming insurmountable odds, Unbreakable: A Story of Hope and Healing in Haiti ultimately a powerful reminder of the triumph of the human spirit, and of how the bonds of hope are of ten times born out of the shackles of despair. The film was sounded 100% by the Knights of Columbus, the world’s largest Catholic service organization. Although a documentary with a social justice message, it was “tainted” by its association with the Catholic organization. The client wanted this one-hour documentary on the air for the 5th anniversary of the Haiti Earthquake (January 12, 2015) and working with only about four weeks lead time (and over the holidays), we still managed to clear one-third of the top 25 markets, achieving placements in some key markets — Los Angeles, San Francisco, New York, Orlando, Tampa, Denver, Salt Lake City, New Orleans, Philadelphia, and Minneapolis. Contact David Naglieri of the Knights of Columbus for a referral.